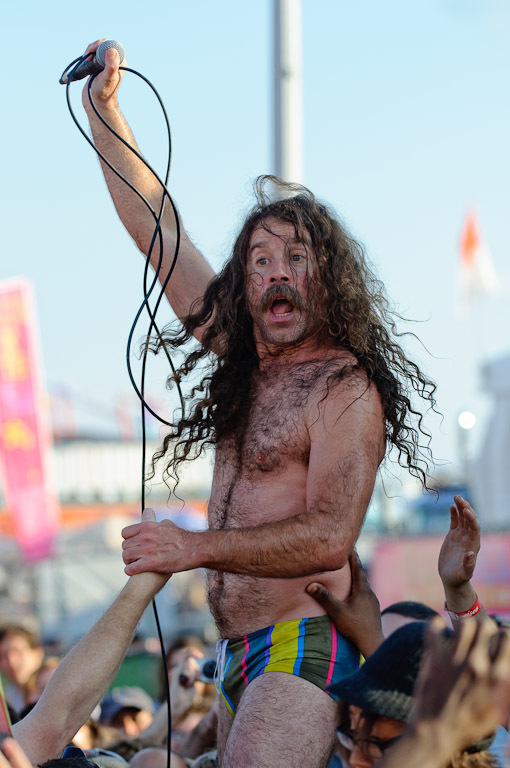 Anyone who hasn’t seen Monotonix is missing out on one truly inspired rock show. The trio consists only of a singer, guitarist and drummer… not the prototypical rock ‘n rol line-up, but believe me, they will prove all doubters very, very wrong. Not only does their music send a surge of raw power through the audience and bind them in the band’s powerful grasp, it unifies everyone through clapping, fist pumping, and hosting band members on shoulders. When I saw them a couple years ago at the Comet, lead singer Avi Shalev even took my pitcher of beer and dumped the entire thing over his head. The whole thing is like one big happy riot. 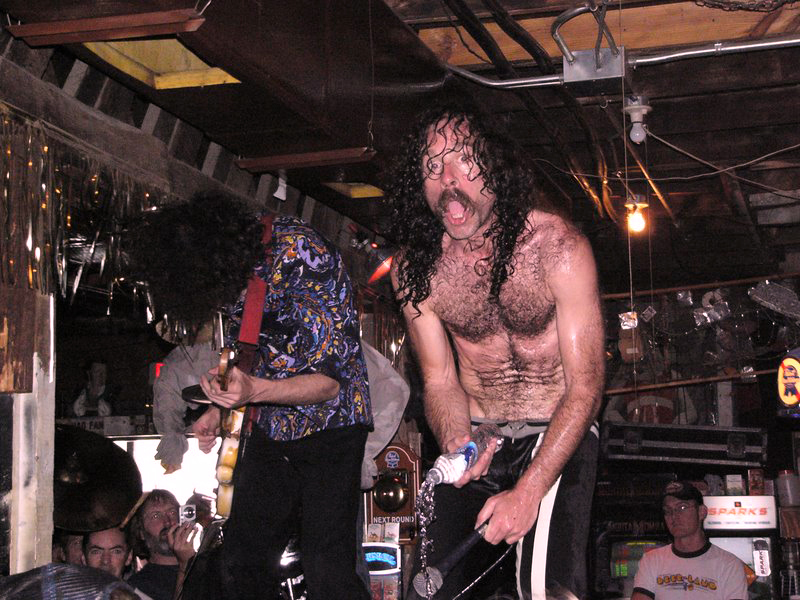 Monotonix bring this explosive, confrontational live show to Fremont’s High Dive on Saturday, July 10. In preparation of this momentus and potentially controversial event (the band’s 2008 Bumbershoot set was cut short when the fire marshall deemed them “too dangerous”), I asked frontman Yonatan Gat a few questions. NadaMucho.com: What was it like growing up in Tel Aviv? NM: What groups or types of music helped influence your sound? Yonatan Gat: We’ve all listened to alot of rock ‘n roll since we were kids, so mostly that. But we like different stuff and different styles. Too much to list. NM: Tell me about the new release Fun Fun Fun / Try Try Try. How was it recorded? What did you do differently on this release? YG: Both songs were recorded live with Steve Albini in Chicago in April, in one of the three sessions that will make our next record. The main difference is that we just gave each other more freedom. The earlier records had a lot of ideas and weird twists that were different than the show. We tried to talk less and play more, this time around, so it’s definitely the most liberated thing we’ve ever recorded. This time around it’s just like our show. NM: That’s good news, considering you are such a definitive live band. How do you go about capturing that live sound? YG: We don’t think about it too much, but every time we go into the studio it seems like the recording process is getting more and more primitive, more live, more minimalistic and energetic. The more time goes by the less overdubs we do. It feels like we’re cutting all the fat around it. It sounds a little more hi-fi than what we did before, but it’s also much more simple and minimalistic. NM: Who have been your favorite bands to share a stage with? YG: We just got to support Pavement in Europe. That was a great recent experience. I’m usually not so crazy about reunions, but they were really great. I felt like they were the last band who ever wrote songs. It was an inspiring experience. Their songs are so good. There are many other bands we like. Friends of ours like Torche, and we’re gonna play the Seattle show with Pierced Arrows who are great. I just saw them in England a month ago. NM: What is your favorite city to play and why? YG: It’s hard to name just one. I like cities that have their own feel, like New York, Paris, Helsinki and Rome. We have fun shows in Brighton, San Francisco, Berlin and Glasgow too. YG: We tried to play Ljubljana in Slovenia and it didn’t work out so well, but it seemed like a pretty city. NM: How about here in the US? What do you like about playing here? YG: It’s really fun how easy-going and fun loving people are over here. A rock n’ roll show is so engrained in the culture. When you go to a small show in a place like Israel, or even in many countries in Europe, it can get kind of weird. People just stand there like zombies and don’t know what to do with their hands. NM: Can you give me a tip on the best places to eat while on tour? YG: I think every country is great at some things and you should try to eat those. In the U.S. I recommend thee Hamburger and thee Milkshake. NM: Excellent choices. How about beverages? YG: I mostly drink water, but I like tea, ginger ale, Coke and Mountain Dew. With alcohol it’s usually whiskey or wine. Again, depending on where i’m at and what I have access to. NM: How many guitars do you bring on tour? YG: Two. My 77 Mustang that I play all our records and shows with, and a cheap spare guitar. NM: Rock and roll dominance such as yours will certainly afford you some celebrity moments. Have you met any of your idols? Who would you like to meet? YG: I’d ask William Bouroughs about his life. I just read about an Ethipoian musician named Mutalu Astake. He returned from a long stay oversees and instead of staying in new york, he went back to Ethiopia and reshaped the way people made music in his homeland, allegedly starting the first bands that were not around just the military. I’d like to ask him about that. But I’m pretty happy with the people I meet. The world has a lot of interesting characters.